After the big showdown at the subway station, we found ourselves at least temporarily free from persecution by the sidhe, specifically the Children of the Storm. Having defeated them sufficiently in mostly-honorable combat, we managed to extricate ourselves from that. That left us headed for a bit of a time-skip, and we pick up the action in July 1999, having spent the better part of two and a half years (28 months) growing from teens to adults. All of us are independent, and either in college, or using our talents to begin to start make it on our own. Over the last two years, we’ve transitioned from mostly being taught how to fight the dark forces, to either arranging for our own training. We arrive in July in Boston, and it’s hot. Damn hot, around 90F. We’re still living with Myriam, mostly because her house is under powerful wards. As we transition out from children to adults, we’ll have to arrange for our own protection in the future. The incident with the Children of the Storm spiked our reputations both as individuals and as a group. With the heat, the homeless population (roughly 3-5% of the city of Boston!) is taking a beating. Amos hits a statistical analysis, and we’re concerned. We head downtown to poke around. Sounds like something we need to check out. Not creepy at all, nothing could possibly be happening there. It’s about 6 or 7pm right now. We decide to do a double recon. Book learnin’ tonight, explore the terrain in daylight in the morning, then more backup research and planning in the mid-day, and hit the place again at dusk, as the sun goes down. We congratulate him on Being Prepared. It makes Timothy’s skin crawl to be this nice. Gabe gives a nod of approval. Gabe and Lorenzo go out; he doesn’t discover anything on the street, but they walks into one of the oldest Pubs in Boston, and the guy behind the counter is doing what bartenders do. But a lot of regular folks are passing the place by as if it’s invisible. And yet I can see it. There are pixies flying around in the bar; two are going at it very violently over the leftovers of a donut. They all stop and look at us. “Ladies. Gentlemen. Other,” Gabe says. Things go back to normal. We sidle up to the bar at the keep’s invitation, and Gabe orders a burger and fries; Lorenzo orders fish and chips and a Guinness. We introduce ourselves. Gabe’s sword is acting weird; Gabe feels it pulsing, almost. We sit down at a booth; a pixie explodes out from under the table waving a colored plastic rapier in a suprisingly menacing fashion. Gabe apologizes for taking their table. They’re mollified. Our food arrives, and Gabe blesses it with Holy Touch (Font) to ensure it’s not faerie food. She asks what we’re doing here. We tell her we’re looking into the homeless situation. Hang out for an hour or so, and she’ll see what she can find out. She says the usual rumors of unseelie and vampries, but there was a less-popular rumor about a pack of ghouls. In exchange for Gabe’s phone number. Seems like a fair trade. Gabe checks in with the team; we agree the ghoul thing (missing rats, then missing people) sounds promising. In a horrid way. Vampires: fire, wood, beheading, sunlight, silver. Susceptible to True Faith. Unseelie: iron and some with silver. Most are not susceptible to True Faith; know their true name and you can control, imprison, or hurt them. Corporeal Restless Dead (Ghouls): fire. Holy water attacks will hurt them. Susceptible to True Faith. Ghouls are once-human beings possessed by a form of demon. The demon effectively murders the soul of the human host and becomes a cannibalistic eating machine. They’re about 4x as strong as a normal person, fast, with disease-infested claws. Bullets are of little use. If they’ve been able to eat flesh, then can mimic effectively the person eaten. They can climb on walls, and have tough hides. Ghoul packs can get up to 20 members, but they’re not infectious – get bit or scratched and we won’t turn into a ghoul, but we could get a nasty disease. Amos and Timothy both find the pub – The Last Call – easily, and can both see it. They come in, sit down, and get threatened by the pixie with the plastic rapier. Timothy, always on point, isn’t taking crap from anyone. He picks up another plastic sword. They duel. First blood goes to the pixie, but Timothy counters with a slash to the shoulder. The pixie salutes him and smiles, and dives back under the table. The newcomers order food, and start considering the chicken wing challenge, but with Essential Jabanero spice. Amos is in heaven. We also have the first “Save vs Death” experience in GURPS, ever, to avoid the effects of the spice. He rolls a 4. He asks for seconds. Our blonde friend returns – we get her name this time. Desiree Cartee (Car-tee-ay). The department she works for in the Conclave has been tracking this for a while; they have nothing. She declines to come into the field with us – she’s not that kind of girl. She does note that bodies had been disappearing from the morgue, but that stopped three weeks ago. When did it start? About a month ago – so bodies disappeared for about a week. Then stopped. Gabe crits an Architecture roll; there’s something to this – the morgue and the subway are connected by extra-large sewer junctions. And ghouls can dig. We ask Desiree if she can have her department at the Conclave look into it? No, they’re understaffed, with the trials coming up. Trials? Yeah, they train and test the magically inclined, for those that aren’t self-taught. Sounds like martial arts rank testing? Yeah, but sometimes you go mad and die. Things are getting weird in Boston. There are only 150 knights; and so they’re hoping that the new generation of recruits has some battle casters in it. Timothy pushes her for some help. She acknowledges she’s seen the “footage” of the subway fight; they stole it, and cleaned up the subway. Oh, the Seelie lord didn’t clean that up? No. subcontracted. We’re worried about how far a tunnel network extends, and how many ghouls we might fight. We decide to check out the morgue first. It’s currently about 8pm . . . back in the morning? We all are forced to sit through over an hour of Amos power point presentation on ghouls. We head over in the morning. The place is kinda dead. Excellent. We get shown the John Doe section. An Architecture roll that I make exactly tells us that the tunnels are mostly likely in the basement; the door to the basement has a long flight of stairs, and it’s musty, dark, and clearly not a lot of folks come down here. The smell of decay and dirt hit our nostrils at once – like a backed-up sewer, with undertones of other things. Like a rich bouquet of putrescence. While we’ve been busy, Lorenzo has been chatting up the night janitor for the place, and he has been talking about seeing ghosts for the last few weeks. Bodies are disappearing piece by piece. We try and chat up the janitor; he claims to have found a broken sewer frame. No one else believes him, but he’ll show us. He shows us. 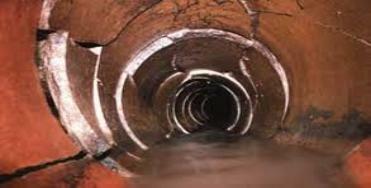 It’s a pipe that goes straight down into the sewers; there are scratch-marks on the inside of the pipe. Things are climbing out – the pipe goes horizontal for a bit, and then goes straight down. It’s maybe 18″ in diameter. Lorenzo, Gabe, and Timothy all gang up to seal up the pipe, having influenced the janitor to talk to his boss about cutting a work order to seal the pipe. We make the roll by 6, and make the concrete with holy water (Gabe is a Font), Timothy does great on his machinist roll, which sets iron into the barrier, and Amos expends a very powerful Charm as a ward. We do such a good job, we get placed on the city planning list of approved contractors on the spot. The next step is to do a bit more planning, and then do our first excursion into the sewer, subway, and tunnels. We’re expecting this to be more than just recon – we expect and will prepare for contact. We end there, but spend a bit more time planning. I suggest that we use something like my Cautious Advance rules to explore the tunnels. Something that lets folks move around a bit, but lets us retain some level of coherency in case combat suddenly erupts. This was a good, solid information-gathering session, and it leaves us with a good plan for next time. We’re still facing a crap-ton of superhumanly strong, fast, resilient foes, with hand weapons and flame bombs. So preparation is key. This particular session highlighted what’s a usual pattern with our group: one full session of investigation, followed by a full session of action and violence. We rarely do halfsies (plan two hours, fight two hours), and I think that’s a quirk of our group, but it works for us. Our characters have grown hyper-capable, as well. I think we’re going to need that power, but I also think we’re maybe about twice as WOW as we’d originally thought we’d be. Still . . . we’re about halfway between Monster Hunters and Black Ops now, which isn’t wrong. As a freelance group of monster hunters, essentially, with a rep that should start to bring us no end of trouble to investigate, things are setting up well for a “what rumor do we check out today?” campaign. Today’s session was pretty great over all. As Doug notes, hitting the books can be boring in a game unless it’s interspersed between other things. I think I did that rather well this time. I think I also kept the pace at a low boil – things will get hot when I need them too. Merlin had to bail about half the session in because of an emergency so that put a cramp in my style. Still all worked out ok far as I could see. I dropped a crap-ton of leads, NPCs, and lines all about – all part of my new plan to help the PCs drive the game across multiple campaigns. We’ll see if it works. I really loved the swordfight between Tim and the unnamed pixie. That was just a bit of awesome. The bit with Amos inhaling the Wings of Doom was cool too. Overall. Good stuff.